With the grinding of the ground layers complete all that is left to do before beginning the finish coats is to seal the ground. There are two options. 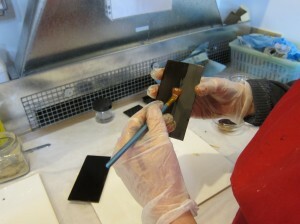 One way is to apply raw urushi, let it soak in, and then wipe off the excess. The second is to apply it as a brush coating and followed by drying in the furo. With this method the ground is sealed but you also have a layer that can be abraded smooth before beginning the finish coats. 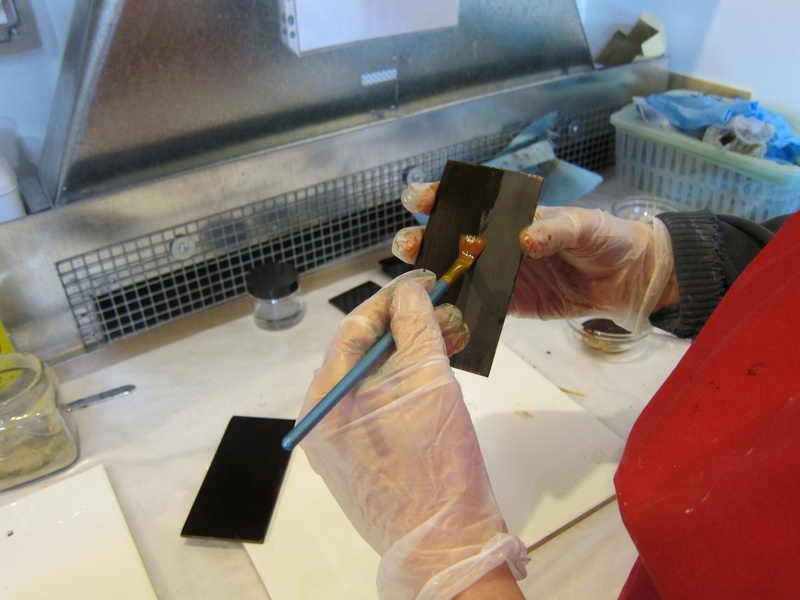 The raw urushi has relatively low viscosity so this layer was easy to apply by brush and leveled quite nicely. It dried to a glossy dark brown surface. Before applying the finishing coats the sealing layer must be abraded until smooth. I used hoo sumo charcoal from Japan. I will describe more about grinding layers with charcoal in a later post.